I've wanted to post this for quite some time now, but laziness has so far stopped me from doing so, and since this was finished quite a while ago, some of the details are already a bit hazy, so to keep the info from deteriorating further, I've decided to do it now. A while back I got a broken PDA for a relatively good price. Broken screen and mobo failure. It was some HP model I don't really remember. After opening it up I found that there was one fried component on the mobo, all the SMD fuses were intact, and since the fried part was a Maxim I decided to free-sample it and try a replacement. 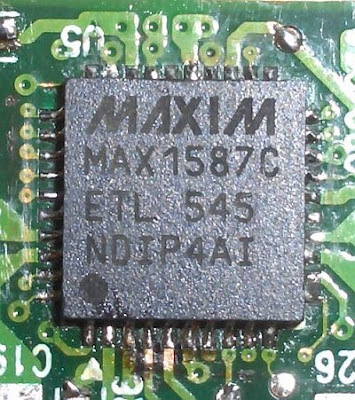 The part was a MAX1586, a "Power Management IC" for PDAs in TQFN40 (6mm x 6mm). It seemed to handle pretty much everything power related for the PDA. The original part was a bit melted-through and would get real hot, real quick, when power was applied, so it obviously needed a replacement. 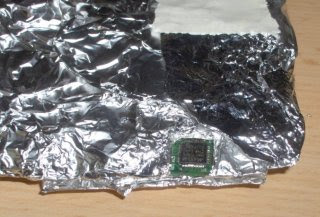 The mobo was wrapped in aluminum foil, in an attempt to shield other components from the hot air. This was mostly ineffective. Below is the mobo after the the extra blown-off components were hastily reattached, before cleaning up the mess. I free-sampled MAX1587, which is a bit higher power than the 1586 was, no special reason behind this, if I remember correctly it was the only part available for free-sampling. 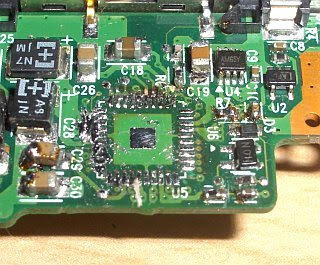 As for soldering in the replacement that was mostly done with luck, an ordinary soldering iron, and lots of soldering resin ( I didn't have no-clean flux at the time ). Below, the mobo with replacement PMIC in, after cleaning up. After about an hour of playing around with setting the chip right, the device did power on. 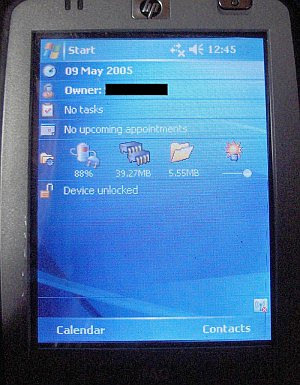 I don't remember if by that point I already had a replacement display, or if I ordered it afterward, but after that was installed the device came to life, functioning perfectly, complete with the original owner's data, which I proceeded to wipe. I kept the device around for about a week, then sold it, with very little financial profit, but lots of experience gained.